Google has made Google Now even more useful to users by creating a card showing gas stations along their current driving route. The card was spotted and shared with the public by a Google+ user, and it’s sparking a lot of questions. 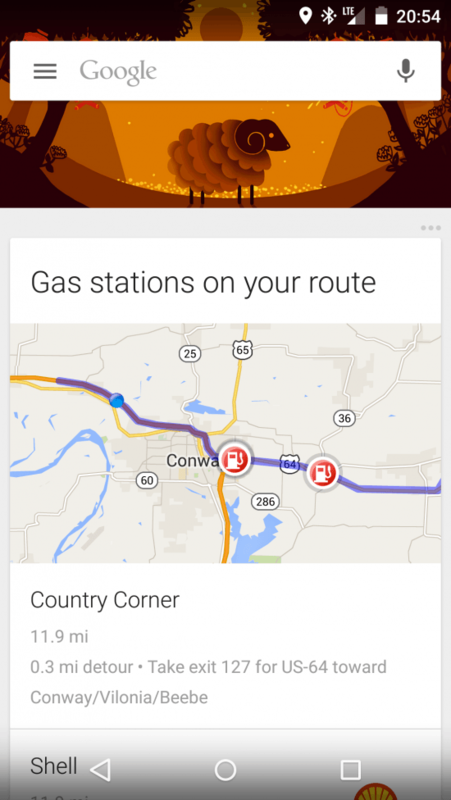 While using his Nexus 5 on Interstate 40 in Conway, Arkansas, Kevin McLaughlin saw a Google Now card labeled “Gas stations on your route,” which displayed two gas stations on his presumed path. Other users have spotted this new Google Now card, though it’s not recognized as an official Google Now card yet. Of course, the question of utmost importance is: Why in the world is this information residing in a Google Now card and not within Google Maps? After all, safe, law-abiding drivers would never even see this gas station card while navigating to their destination using Google Maps, the scenario in which this type of information would be most pertinent. This is even more perplexing when you remember that Google actually integrated this feature in an earlier version of Google Maps for Android 2.0 smartphones, which allowed users to search along their route to find gas stations, among other things. The feature has since been removed. It’s also worth noting that Google-owned maps app Waze has a feature enabling users to look for gas stations along their navigation route. Gas prices are also included in the crowdsourced gas station information in that app. It’s safe to assume that Google knows all this and that it will only be a matter of time until gas station and other relevant information is more seamlessly presented to users based on their current circumstances.